Powerful and user-friendly, the new Info-Touch provides advanced engine monitoring, with touch screen ease. 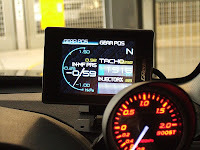 Installation of the 3.5” Color TFT unit is made simple with the provided OBD/CAN and 12V cigarette lighter plugs. The Info-Touch is ideal for most vehicles, from stock cars to highly-tuned street machines.